Making podcasts is a simple process, all you have to do is fire up GarageBand and get talking. However, as with most things achieving a high-quality result requires a little more application. An application such as Humble Daisy ProfCast. ProfCast allows you to take your presentation and publish it as a podcast in a variety of formats. This means you don't have to learn a new podcast app and can keep a uniform style to your lectures or presentations whether they're given in person or distributed over the internet. 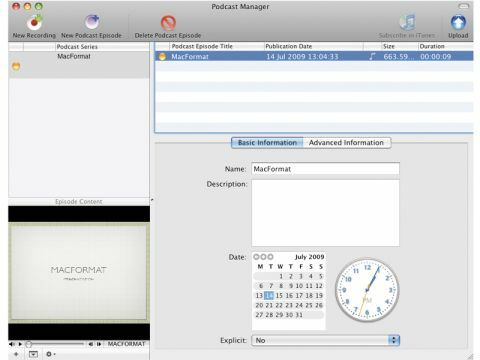 ProfCast is essentially a conversion utility with a podcast-specific slant. It does its job well and if you use Keynote or PowerPoint on a regular basis then it makes turning your presentations into podcasts simple. You can start your podcasting empire easily and the way it allows you to publish to a variety of places makes ProfCast very flexible. However, we think it's a touch on the expensive side. But, there is a free trial version you can download. As for making your life easier then ProfCast certainly does, but only if you're going to be regularly producing podcasts of your presentations. For a oneoff or irregular production schedule Keynote and GarageBand are more than likely going to suit.